A young man torn between fulfilling the expectations of his family and following his heart, Manolo embarks on an adventure that spans three fantastic worlds where he must face his greatest fears. The DTS-HD MA 7.1 soundtrack of Book soared, as it came with a wide variety of sequences that gave us chances for vivid material, and it brought those out in a satisfying way. The movie used action and magical scenes to allow elements to zoom around the room, and other set pieces threw many different elements at the viewer. The disc opens with ads for The Peanuts Movie, Night at the Museum, Penguins of Madagascar and Russell Madness. We also get a trailer for Book. A second disc presents a DVD copy of Book. It includes the commentary, “Chuy”, “Music Machine”, the gallery and the promos. 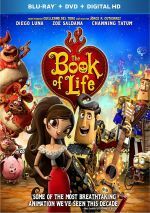 After a slow start, The Book of Life turns into a likable little adventure. With creative visuals and fun circumstances, the film embraces fantasy and emotion to a successful degree. 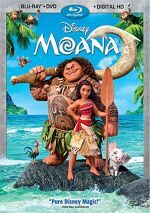 The Blu-ray boasts excellent visuals as well as very good audio and a moderate array of supplements. 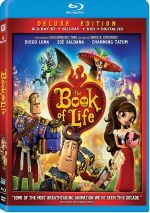 Book becomes a mostly engaging animated tale.